For the third year running, I returned to Brown to give a guest lecture about using Python in GIS for GEOL1320: Introduction to Geographic Information Systems for Environmental Applications. I’ve used ArcPython extensively in my work at Cadmus, and it’s exciting and heartening to be invited to lecture to GIS novices about the topic. Nonetheless, the lecture is a challenge. I don’t have any formal experience teaching undergraduates. Moreover, it’s practically impossible to teach a programming language (even one as intuitive as Python) in an 80 minute time slot, let alone its nuanced GIS applications. 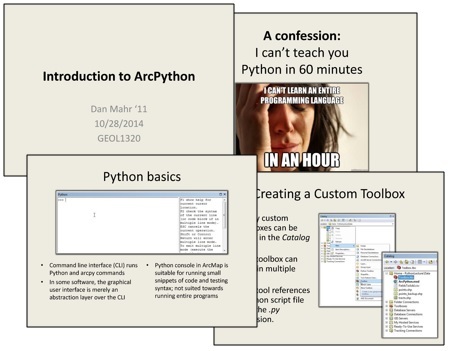 Thus my strategy has been to think of the lecture as an icebreaker: a way to take away the barriers and scare-factor associated with getting started with Python. After a brief introduction, I showcased a few real-world examples of how I’ve used ArcPython in my work. Then the whole class worked through a live demo, doing a fairly simple task—adding fields to a feature class—using progressively more complex Python commands. Eventually, we even packed the final tool into a Python custom toolbox connected to a separate .py script file. This year was definitely the most successful yet. The fact that students typed the commands themselves in a lab-format class made for a more engaging and effective class versus students watching me type in a lecture-format class. I hope these GIS novices got a good sense of what is possible with ArcPython. My slides are attached below.